The Australian Ship Reporting System (AUSREP) is compulsory for Australian-registered commercial vessels and for foreign vessels on voyages between Australian ports. All other vessels are encouraged to participate when within the AUSREP area. 1. Limiting the time between the loss of a vessel and the initiation of SAR action, in cases where no distress signal is sent out. 2. Limiting the search area for a SAR action. 75°E and 163°E, and extends N to approximately 6°S at its W limit and to 12°S at its E limit. The limits are best seen in the accompanying graphic. The system is operated by the Australian Maritime Safety Authority (AMSA) through AusSAR, specifically the Rescue Coordination Center Australia (RCC Australia). The AUSREP/REEFREP Interface, a two-way automatic data exchange interface, has been implemented between the REEFREP Ship Reporting System and the existing AUSREP system. This will avoid the need for dual reporting by vessels when participating in the AUSREP and REEFREP systems and will enhance the information available in each system. Further information about REEFREP can be found in Pub. 127, Sailing Directions (Enroute) East Coast of Australia and New Zealand. 1. 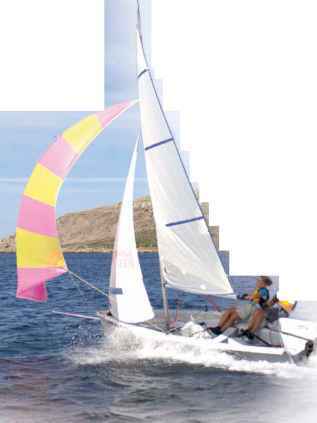 Masters are to send a Sailing Plan (SP) to RCC Australia. 2. A computerized plot is maintained of the vessel's estimated position. a. Position Reports (PR) are sent to RCC Australia each day between 2200 UTC and 0800 UTC at the time that has been nominated by the vessel's master so that a report is received at least every 24 hours. Dates and times shall be in Coordinated Universal Time (UTC). b. Masters may agree to their vessels being queried via INMARSAT-C which, when requested, will automatically send a PR. 4. On arrival at the destination or on final departure from the AUSREP area, a Final Report (FR) should be sent to RCC Australia. 5. Should a vessel at any time be in a position more than 2 hours steaming from the position that would be predicted from the last SP or PR, a Deviation Report (DR) should be sent to the MRCC. 6. All dates and times used in AUSREP reports are to be in Coordinated Universal Time (UTC). 1. At ports within the REEFREP area, the SP must be sent prior to departure. 2. At other Australian ports, the SP may be sent up to 2 hours after departure. 3. When entering the system from sea at an ocean boundary, the SP may be sent 24 hours prior to entering the area or up to 2 hours after crossing the boundary. The SP contains information necessary to initiate a plot and give an outline of the intended passage. If a vessel does not sail within 2 hours of the time stated in the SP, then that SP must be canceled and a new one sent. In the case of a foreign vessel departing on an overseas voyage from an Australian port, if the Master does not intend to send AUSREP Position Reports, this fact must be indicated in the SP by the inclusion of the word NOREP in place of the nominated daily reporting time in Field N; amplifying remarks may be included in Field X. Under this option, RCC Australia will not undertake SAR action unless specific information is received which indicates an air search is warranted. However, a NOREP vessel must still comply with the mandatory REEF-REP reporting requirements when the vessel enters the REEF-REP area. The AUSREP report format for an SP is given in the accompanying table. Position Report (PR).—The PR is sent at the Date/Time of Next Report as listed in Field N of the Sailing Plan. These reports must be sent between 2200 UTC and 0800 UTC at the nominated daily reporting time until and including the day of arrival in, or departure from, the AUSREP area. The interval between PRs should not exceed 24 hours. The information contained in the PR will be used by RCC Australia to update the plot. The PR must reflect the position and course of the vessel at the designated reporting time. However, the speed should be the anticipated speed until the next report time. The PR is normally automatically processed by RCC Australia, but may not be seen by an operator. If the PR contains important additional safety information that requires the immediate attention of the operator, the word "ALERT" should be placed in Format Field X of the PR. The word "ALERT" should be used only to identify important safety information for immediate action. The ETA at port of destination or AUSREP area boundary should always be confirmed in the last PR of a passage. It may also be amended in any PR whenever the Master is aware of a revised ETA. INMARSAT-C terminal to prompt an automatic position report, which includes the vessel's position, course, and speed. INMARSAT-C polling eliminates the need for a manual submission of the PR. Sailing Plans, Deviation Reports, and Final Reports must still be submitted as normal. The AUSREP report format for a PR is given in the accompanying table. Deviation Report (DR).—A DR must be sent to RCC Australia if a vessel, at any time, is in a position more than 2 hours steaming from that which would be predicted from the last SP or PR. A DR can also be sent when any other voyage details are altered. Failure to send an appropriate DR may have a negative effect on SAR operations. If the vessel is in distress and has not sent out a distress message, the AUSREP procedures may result in RCC Australia initiating an air search to locate the vessel. The search aircraft will start looking in the area related to the vessel's route and speed as indicated in the SP and subsequent PRs. If the vessel has not submitted a DR when there is a change in route and speed, the search aircraft may be unable to find any survivors. It is in the vessel's best interest to keep RCC Australia up-to-date on all voyage details. 1. For vessels enroute overseas and departing the AUSREP area, the FR should be send at the AUSREP boundary. 3. For vessels ending a voyage at any other Australian port, the FR can be sent within 2 hour's steaming of the port or pilot station. Under no circumstances should the FR be sent more than 2 hours prior to arrival. As an alternative, the FR may be telephoned to RCC Australia immediately after berthing, but not more than 2 hours after arrival. If it is known that the vessel is to anchor or berth where telephone facilities are not available, the FR should be sent via the appropriate coast radio station or INMARSAT-C. The AUSREP report format for an FR is given in the accompanying table. Overdue AUSREP Reports.—AUSREP is a positive reporting system. If a PR or an FR is not received by RCC Australia within 2 hours of the expected time, action is taken to determine the vessel's location and confirm the safety of the crew. It should be noted that in some parts of the AUSREP area, the ability to conduct an air search may be restricted by aircraft range limitations. To avoid unnecessary search action it is most important that vessels report at the nominated reporting time each day and send their FR when leaving the AUSREP area. If a vessel is unable to pass a PR or an FR, all attempts must be made to pass a message to this effect through another vessel, a harbor, or other shore authority either by VHF, signaling lantern, or emergency transmitter. 1. Internal checks to establish if the vessel's report has been received by RCC Australia. 2. For INMARSAT-equipped vessels, an attempt to contact the vessel directly. 3. Attempts to contact the vessel via HF DSC. 4. When 6 hours overdue, a broadcast of the vessel's call sign, with REPORT IMMEDIATE preceding traffic lists, indicating concern due to non-receipt of the PR or FR. 5. Extensive communication checks with Australian and overseas CRS, owners, agents, and other ships are carried out to trace the last sighting or contact with the vessel. 6. When 21 hours overdue, the upgrading of the REPORT IMMEDIATE broadcast to the Urgency Signal PAN PAN indicator. By the time 21 hours have elapsed, search planning will be in progress and details included in NAVAREA X and facsimile weather broadcasts. By the time the report is 24 hours overdue, positive SAR action will have been initiated to locate the vessel. It should be noted that resources available for an air search decrease with the distance from an Australian base and that the times may differ if the vessel is participating in INMARSAT-C polling. 1. In an Australian port.—All reports should be made from the vessel directly to RCC Australia, in order to avoid delays that may be associated with using intermediate agencies. Collect telephone calls, facsimile messages, or INMARSAT-C may be used to send an SP or an FR. 2. Via INMARSAT.—Reports must be addressed RCC Australia and sent via the Pacific Ocean Region (POR) or Indian Ocean Region (IOR) satellites to Xantic Land Earth Station (LES) Perth. These procedures apply only to AUSREP messages. Calls are free of charge when submitted within the AUSREP area. INMARSAT-C fitted vessels will not be charged for messages sent via INMARSAT-C if these procedures are followed: Select Special Access Code (SAC) 43 through Xantic LES Perth only; Pacific Ocean (222) or Indian Ocean (322). INMARSAT-A, B, or M fitted Ship Earth Stations will be charged for messages sent via INMARSAT-A, B, or M to RCC Australia. While participating in AUSREP, vessels should ensure that their INMARSAT equipment remains active in the LOGIN mode at all times. The preferred method of submitting an AUSREP report is via INMARSAT-C using the previously-described polling option as opposed to sending the reports manually. Reports to AMVER.—While participating in AUSREP, masters may also wish their reports to be forwarded for inclusion in the AMVER system operated by the U.S. Coast Guard. This should be indicated by including the word "AMVER" in Format Field Y in each message. For vessels participating in INMARSAT-C polling, if Format Field Y in an SP indicates that the reports are to be passed to AMVER, the AUSREP system will automatically forward PRs to AMVER. An AMVER report will only be forwarded if a vessel is in the AUSREP area and is currently participating in the AUSREP system. Reports to other reporting systems.—Reports from forwarded by RCC Australia. Ship are requested to pass ships to other reporting systems (JASREP, etc.) are not these reports direct. Vessel name, call sign and IMO number. Speed (vessel's anticipated average speed, in knots and tenths of knots, until next report). Name of last non-Australian port of call. 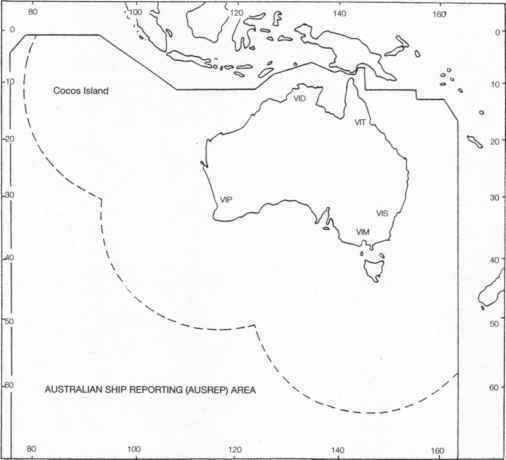 Date/time and point of entry into AUSREP area (point is either the Australian port of departure or the latitude/longitude of crossing the AUSREP area boundary). Next foreign (non-Australian) destination and ETA. 2. Last name of pilot. 3. License number of pilot. Date/time and point of exit from the AUSREP area (the point is either the latitude/longitude of crossing the area boundary or the Australian port at which the vessel is to arrive). Route (vessel's intended track—state rhumb line or coastal, great circle, or composite with limiting latitude). Coast radio maritime communication stations monitored (include INMARSAT A and C numbers, if fitted). Draft, fore and aft, in meters and tenths of meters. Pollution (or reports of any seen). Vessel type, length (in meters), and gross tonnage. 2. R—Vessels transiting the REEFREP Ship Reporting System should also include these fields. 1. See text under Sailing Plan for vessels electing not to participate in the AUSREP system. When polling is selected as the method of position reporting, the word "POLL" should be included in this section. 2. Place the word "AMVER" in Format Field Y; do not separate the letters in the word "AMVER" by spaces, as this may disrupt the computer processing. Masters should note that an AMVER report will only be forwarded if a vessel is in the AUSREP area and is currently participating in the AUSREP system. What is AMVER JASREP AUSREP? What is AUSTRALIAN ship reporting system? How to report to ausrep?